The Fruit Basket Cake: Fresh fruit, an airy chiffon cake, and lightly sweetened whipped cream make a delicious dessert perfect for a special occasion. At the Sunday Farmer’s Market there continues to be an abundance of wonderful berries available so I decided to show you how to make a fruit basket cake. Essentially it is a white/yellow cake filled with fresh fruit and iced in whipped cream. Simple, classic, and oh so delicious. Many bakeries do it differently, using different fruits. It is a cake I’ve done more times than I can remember, but until I started working at the local bakeries, I never knew there was an actual name for it. The fruit basket cake is by far the most popular cake at any bakery I’ve worked at. At the bakeries where I’ve worked, it is usually filled with strawberries and bananas, but you can definitely substitute the fruit with whatever fruit you prefer. I’ve used blueberries, pineapple, kiwi, and mandarin oranges as well! It’s probably the closest thing to a guilt-free cake you’re going to get. A client of mine even ordered this cake for a special breakfast treat once! – Cake for breakfast? I’m in! And I’m going to show you how to make this fruit basket cake, just like they’re made at the bakery, with tips throughout the post to make it foolproof! 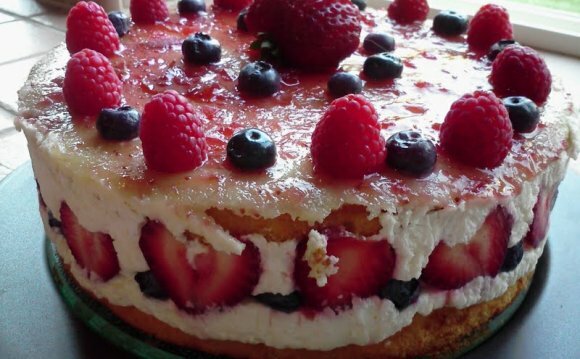 No buttercream, no sweet fillings, just lightly sweetened freshly whipped cream and fresh fruit and sometimes that’s just what you’re craving, especially in the summer months. And as I type that, let me show you the sugar raining down… lol.. it’s really not that much compared to other cake recipes, I swear! This recipe is also versatile! The foundation begins with your favorite white/yellow cake recipe or even a cake mix if you prefer. What I almost always use is my trusty chiffon cake, just like my lemon chiffon cake (except omit the lemon juice and zest and replace with 1 tablespoon vanilla extract to become a plain chiffon cake) just to let the fresh fruit really shine through.I love how the airy nature of the chiffon cake compliments the other components of the fruit basket cake. If you’ve ever had a cake from an asian bakery before, the chiffon cake in this recipe is probably really similar, if not exactly like it. It bakes at a lower temperature to minimize the dome on top. But it may still have a slight dome which needs to be trimmed, especially with a fruit basket cake. I never do more than 3 layers of cake and 2 layers of fruit because it can become unstable and you also get bulges on the sides from the weight of the fruit and the cake. I’ve done it with 4 cake layers before but it was just too unstable and difficult to cut. Another trick to keep this cake stable is the way you layer the fruits. Place the heavier fruit on the bottom layer and the lighter/more slippery fruit on top. Keep the fruit about a 1 inch away from the edge – when the next layer of cake is added, the fruit shifts/spreads and comes to about 1/2 inch from the edge of the cake. I will also press each cake layer firmly into the filling below. This also helps avoid those bulges that happen when a cake still needs to “settle”. The cake is filled and iced in stabilized whipped cream which is so delicious! I like to stabilize my whipped heavy cream using Dream Whip or a whip aid (Dr. Oetker Whip It – Stabilizer for Whipping Cream – I buy this in bulk from Amazon, but either item should easily be found at grocery stores near the gelatin or at Cost Plus World Market). Edited to add: Another option, if you would like to avoid dairy or want something that is a bit more stable, I recommend Pastry Pride (found at Smart & Final and Cash & Carry) instead of whipped cream. It tastes like cool whip and can be left at room temperature, though I’ve never had success using the cool whip/non-dairy whipped topping in the frozen section of the grocery store. Edited on 2/17/15 to add: Here’s a recipe for stabilizing whipped cream that uses cream cheese. I’ve used this in a pinch when I didn’t have any powdered stabilizer around (just triple it to make enough whipped cream). When icing the cake (I’m so sorry I didn’t get a picture of this! I really should make a cake icing video/tutorial!) I force whipped cream into the gaps between the layers of cake, covering and packing the fruit in without worrying about covering the cake at first pass. I then smooth my spatula around the cake to make a rough crumb coat around the sides of the cake. If any fruit is sticking out, I just poke it back in with my finger =) (very technical right?). Then I just finish icing the cake: start at the top, then the sides (making sure the icing goes all the way to the top). Smooth sides with a bench scraper or other icing smoother tool, then the top using your icing spatula. For the cake pictured, I used a #22 decorating tip for the bottom and top borders. Ladies and Gentlemen.. are you ready? Extra Strawberries, Kiwi and Berries for arrangement on top (optional). You can substitute the fruit for whatever fruit you prefer. I do strongly suggest against any "slippery" fruits for the filling, like canned peaches.